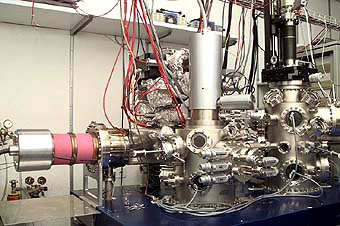 The images show two examples of customer designed UHV-Systems. Wether you plan a new system from scrach, or you inted to expand your existing system with a new chamber, wether you are a self builder or you need a fully functional system, we are ready to assist you with our engineering experiance. We can provide UHV-chambers, partly assembled systems on a workbench or fully equipped and tested experimental stations.Please contact us for a detailed discussion of your requirements. The image below shows the SEMPA system of ETH-Zurich.